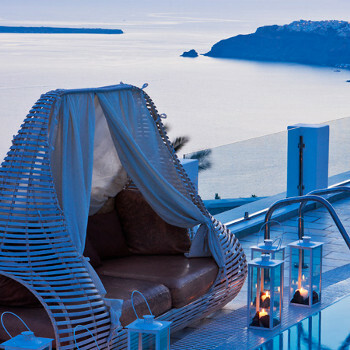 The Santorini Princess is a 5 star hotel located in the resort of Imerovigli, Santorini. This intimate 22 room luxury spa and hotel has 2-4 person luxury apartments and can easily cater for both couples and families with facilities such as restaurant, swimming pool and bar. These are luxury Honeymoon Apartments and spa room which is situated on the edge of a cliff with amazing views over the caldera. We have just returned from a 2 week Honeymoon and cannot believe how lucky we were to have stayed at such a fantastic place. The Hotel was opened about 2 years ago by 2 brothers and they really have got it right. The staff are always standing there waiting for you to call them over if you need anything, towels, drinks, food, ashtrays etc and can not do enough to help. The whole place is kept spotless, everything is immaculate. The food is gourmet and nice even though a bit pricey but the snacks are good value for money, club sandwiches, pizzas, omlettes etc. It's located between Oia and Fira with a 10 minute taxi ride to either town which is perfect if you are looking for relaxtion. There is no entertainment as it isn't that sort of place. Through the day we relaxed by the pool listening to gorgeous chilled out music while being waited on hand and foot and by night we sometimes ventured out by taxi to fira or Oia for a slap up meal and a few drinks before wondering around the little streets and browsing the shops. They also have a lounge with state of the art tele and internet access. I would go back tomorrow if I had the chance it is fantastic.